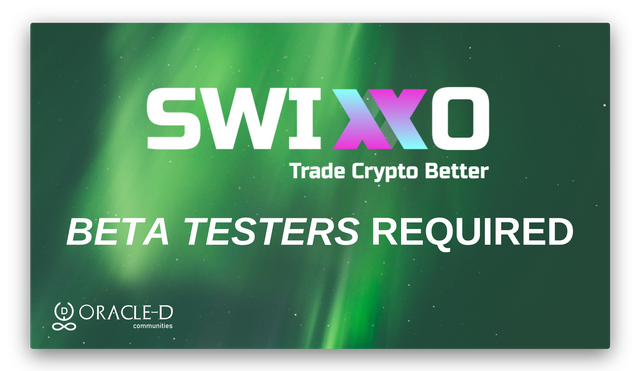 Swixxo Exchange is Looking for Beta Testers - Earn Rewards! Almost Three weeks ago on 6th March, we announced about @swixxo listing STEEM Token in partnership with @Oracle-d. It's a newly launched cryptocurrency exchange with low fees powered by a cutting edge trading platform. In order to improve the exchange and provide more features, we need your assistance and valuable feedback. Join today to start trading STEEM and other cryptos like BTC, LTC, DASH etc. Offer valid till 23rd April 2019. Note: Please resteem this post and tag any traders you know on STEEM who might be interested in this opportunity. Talk about your experience and review the exchange through a STEEM blog or vlog and you might get a chance to earn a few upvotes from @Oracle-d account. Don't forget to use the above link for signup. Welcome to the new Signup Widget for @Steem.Ninja. It was never easier to onboard people to Steem directly from your website! This can be easily integrated into any website by using our "Ninja Widget Generator". You can set a custom logo, brand name and a referrer account which will receive $0.50 USD worth of Steem and 0.5 NINJA for each sold account. This is not financial advice, nor a guarantee or promise in regards to any result that may be obtained from using the above content. The information provided here is for informational and entertainment purposes only. It should not be considered as financial and/or investment advice. No person should make any kind of financial decision without first consulting their own financial adviser and/or conducting their own research and due diligence. Signed up, and to my surprise this exchange looks appealing to me, especially compared to some other exchanges. This one would definitely be one that I would actively use for trading. I hope I get selected for the Beta test phase.. Thanks for giving this opportunity! It was great to learn about @Oracle-d at the London Steem meet up last night! I will defo be checking this out and am now going to upvote them as a witness. Yes, please post the links in comment section of this blog. Great work @oracle-d you unlocked great opportunities day by day and it is a huge privilege as well. Will do as soon as I get my laptop back. I checked out the site and the interface seems to be very beautiful. Well, I am not very active with crypto trading but I will like to call on @burlarj @minhaz007 @steemcameroon @mango-juice @ajongcrypto @project-m to come check this out! @destinysaid @smithmadu @rufans when I think of traders, I think of you guys, with low fee and 1 month free trading this is simply a deal you wouldn't want to miss. Although, its still in its beta stage. That being said, you could get additional reward if you made a review about your experience using it. terima kasih atas informasinya @Oracle-d. I have hovered to arrive there. Of course it's a new thing to try. Several opportunities will enable us to transact there. Congratulations to the team and developers who have worked hard. We hope there will be something better than this chain block there. Awesome initiative, it was a wonderful opportunity to check on the beta phase. The more user test the exchange ,it will add more value to Steem in crypto world.... @allesia @azhardesk @cnts @sanmi please make use of the chance.. I'm feeling positive about this. Truth is, I'm not a trader but my friend @smithbap is one and he'd love to be a part of this. I've always wanted to delve into trading but procrastination always gets in the way. Wow @oracle-d way to go, Okay, another splendid opportunity really, is it possible if I can know if there's a deadline for this campaign I mean the review? maybe 7 days? Each and everyday @oracle-d keeps advancing the steem blockchain with diverse activities . Keep up the good works champ. Please come see something that might be of interest to you, @agbona @neoxian @einsten @yandot @cryptogod2018. This is great. Hope there's no minimum amount of steem required for the beta testing? Because I'll love to join the beta testing. I know some traders that'll also be interested; hey @ememovic, @harbysco, @amec, @turpsy, @steepup, y'all can join the better testing. I will be apart for the tester program. And congrats to Oracle-d, you unlocked the achievement day by day. Upvote and Resteem done. I'm calling on future trader @mistakili @tifebaba @snappy @soundwavesphoton @femcy to join in this campaign. Steem to the moon. Oracle-d keep evolving. Whatever Project oracle-d supported is a goal. steem is growing in all the way and let us be a part of this revolution. Not bad. Worth a try, think? I am trying to sample a deposit of STEEM but it seems difficult. Can @oracle-d help out? I hope they have an account on STEEM to aid transactions just like @bittrex. Meanwhile, I invite @Liltom002 @Maxdevalue @Prettyglo @Theonlyway @Evegrace @Imaluv54 and @You34 to join this. thanks for the invitation, I will look for information, I would like you to send me a link that spreads more about telos I do not enroll, telos uses resources from the pc or is online with Steemit? I have not really researched on the subject. Check this post more information. Terima kasih atas informasinya @oracle-d. Sangat bermanfaat bagi kami semua. Hello, i recently found you and learning about crypto in general. May I ask when the beta tester group will be selected? And will they be selected by Swixxo or by Oracle-d? Can someone please answer this question? :) @oracle-d @oracle-d.tasks ? Can't find the answer in the posts, and I would like to know more about the selecting process if possible. Thanks in advance! I've already registered, the platform looks intuitive, simple and functional, what I suggest is that in the future you can move to Spanish. @oracle-d Team, I've signed up but yet to experience the Trading. And Steem is getting adoption, collaboration and integration and it's really generating the enthusiasm. Keep up team. I registered with Swixxo about a week ago. and many things that make me like at Swixxo. especially in the wallet section. everything is written very complete. also in trade. this greatly facilitates me as someone who has never had experience. 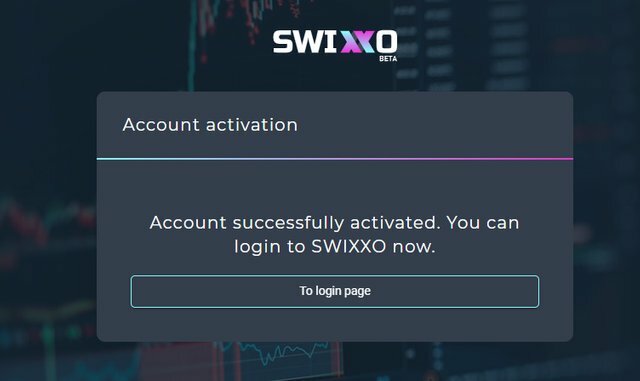 exchanges in Swixxo are very complete compared to other exchanges. and I will learn how to exchange at Swixxo. because everything looks very easy to understand. until now I had no idea how to exchange. when I saw exchanges in other places I was very confused. I really don't understand. and every time I want to make an exchange I have to ask for help from a friend. and of course I have to give him a salary. also when I want to invest, I dare not ask for help from friends. I'm afraid of being lied to because I don't understand how to invest. this is the only barrier that makes me afraid to invest. I am sure I will know how to make an exchange through this Swixxo. everything looks very complete and easy to understand. This is an another great chance for us. If it's a good replacement for us over Binance or Bittrex etc and suits our requirements, then why not. I really enjoy using Changelly to exchange my funds since they have a fixed fee (0.5% always) and according to my short research, comparing with other exchange platforms, their rates are quite beneficial. And very good technical support. Thanks @masud91 a wonderful opportunity and thanks for the tagging. Just signed up. Would have to use for some days to write a review, so expect it soon. Why does it need KYC to trade? Steem day by day going perfect place. This is perfect opportunity. Congratulations your succeeding on this exchange site. Page looking freaking cool ! Not bad, let me give it a try. As far as my trading is concerned i hardly do any Sir just because i believe in long term hold but still i will be happy to test it tonight ill just sign up for it and most probably after using it for one week ill be giving my review about the exchange and try to spread the awareness about it. Thanku sir for bringing this in light.